This immersive ice skating experience brings the magic closer to fans than ever before through engaging elements that take place on the ice, in the air and in the seats. Journey across the Marigold Bridge with Miguel from Disney●Pixar’s Coco into the magnificent and mystical Land of the Dead and discover a vibrantly colorful performance with skeletons atop sway poles dancing over the audience in a beautiful cultural celebration of family. 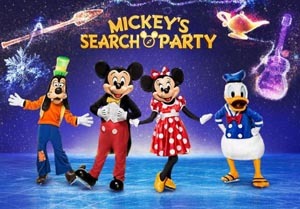 Ticket Prices: Tickets for Disney On Ice presents Mickey’s Search Party start at $15.